Two teams based in southern California will complete a 3 game series tonight as the San Diego Padres square off against the L.A. Dodgers. The results of the first 2 contests have been somewhat surprising. The Padres entered the series with an early season record of 2-10 while the National League stars of Tinsel town were 7-5. There was an added touch of suspense given the Padres Carlos Quentins charging the mound resulting in a broken collarbone for the Dodgers $147 million dollar man Zach Greinke last week. I’m old enough to remember when the $6 million dollar man (aka Lee Majors in a TV series by the same name) was considered the going rate in Hollywood. In any event, nerves have remained calm while San Diego has captured games 1 and 2 of the series. Monday night it was of all things a 3 run homer by the pitcher (Eric Stults) that was the difference in a 6-3 triumph on Jackie Robinson Day. Perhaps the events of the day in Boston subdued any lingering hostilities between the 2 units. Things remained civil last night when the Padres bats did all the talking in a 15 hit barrage and subsequent 9-2 victory. Of course it is very early in the season but tonight’s battle pits the 4th place Dodgers against the last place Padres. L.A. does own a comfortable 3 game lead above the cellar dwellers but it’s not what they had in mind when entering this season with the likes of Carl Crawford and Adrian Gonzales in their lineup. L.A. trails the Giants by 2 and first place Colorado by 3 in the N.L. West. Tonight’s first pitch is scheduled to be thrown at precisely 10:10ET in Dodger Stadium. The man throwing that pitch will be southpaw Clayton Kershaw (2-1). He of the 1.16 ERA after 3 starts this year. 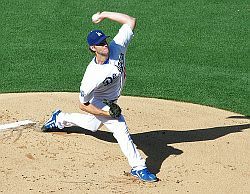 On opening day all Kershaw did was shutout the World Champion Giants 4-0 and hit an eighth inning round tripper himself to begin a 4 run inning and a complete game victory for himself. In his next start he went 7 more shutout innings vs. the Pirates allowing just 2 hits and fanning 9. His last time out he pitched well enough to win but did not receive any run support in a 3-0 loss to the D-Backs in the desert. Right hander Tyson Ross (0-1, 4.82 ERA) takes to the hill for San Diego. he’s pitched twice against Colorado with the second time out resulting in a no decision. The Padres lost both games and Ross has had control problems. He has issued 7 base on balls in 9 and a third innings of work thus far this year. The Padres may get a lift with the anticipated return of hard hitting Chase Headley. Headley has yet to appear in a regular season contest due to fracturing his thumb during spring training. San Diego is 3-2 against the Dodgers in head to head play thus far in 2013. MDG's expert on professional Hockey and Baseball.